MONROVIA – Nobel Laureate Leymah Gbowee has stressed the need for a concerted effort towards the empowerment of vulnerable people in the Liberian Society. 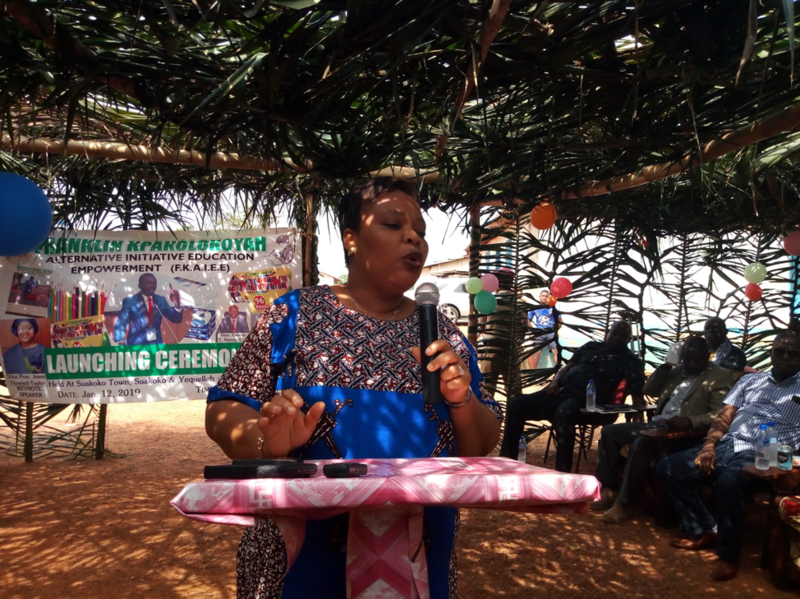 Madam Gbowee said such effort must involve a close collaboration amongst charitable foundations as well as public and private institutions working to improve the condition of vulnerable people, especially women and children in the country. Madam Gbowee noted that this will enable the mentioned institutions to effectively align and foster their activities in helping the needy. The 2011 Nobel Laureate was speaking recently in Suakoko, Bong County when she served as chief launcher of the Franklin Kpakolokoyah Alternative Initiative Education Empowerment (FKAIEE). She pledged the Gbowee Peace Foundation’s supportto closely work with the Franklin Kpakolokoyah Alternative Initiative Education Empowerment in providing educational opportunities for various school-going kids. Madam Gbowee who made an initial contribution of one hundred thousand Liberian dollars to the foundation, lauded the Chief Executive Officer of FKAIEE, Mr. Franklin Kpakolokoyah Locula for the establishment of the foundation and encouraged the people of Suakoko District to take ownership of the initiative. She admonished Mr. Locula and other members of the foundation to demonstrate leadership and ensure transparency and accountability in appropriately administering the affairs of the foundation. “I think several women and girls can also obtain education throughthe Franklin Kpakolokoyah Alternative Initiative Education Empowerment Foundation, adding that we all can work to expand the work of this organization to increase educational opportunities of women and girls”. Madam Gbowee emphasized. Also speaking, Vice President Jewel Howard-Taylor expressedgreat interest in supporting humanitarian work particularly in education so as to elevate the country’s human resource development situation. “As a humanitarian myself, I have a unique interest in good pursuits of this nature—an endeavor that bears the potential to positively impact the lives of people and enhance communities”. “First, the desire to establish a foundation must originate from a heart wrapped in the desire to serve humanity. The alpha and omega of the formation of a foundation has to be the inner drive to do good; to effect change in situations for the better, and resultantly to unshackle people from limitations that hold them down so as to uplift them unto loftier heights”. “An overwhelming percentage of community or public foundations will mobilize resources from generous donations from people of good will.It is thus incumbent upon the Foundation’s board to provide the oversight needed to ensure the judicious use of funds. One should never undertake the formation of a foundation mainly to gain for oneself or provide employment for others. That cannot be primary”. Vice President Jewel Howard-Taylor statement was contained in a speech delivered by her Senior Policy Specialist, Anthony Kesselly. She encouraged the executive members of the foundation to focus on education, adding that she views education as highly critical to the unleashing of the potential of people so as to be able to take charge of their own destiny. Speaking earlier, the Executive Director of FKAIEE, Mr. Franklin Kpakolokoyah Locula said the foundation was established in 2009 with the aimed to help less fortunate andthe underprivileged in the Liberian society. Mr. Locularevealed the foundation initially provided scholarships for about one hundred students at the African Methodist Episcopal University (AMEU) and led a series of sensitization awareness initiatives during the deadly Ebola outbreak in 2014. Mr. Locula said FKAIEE will continue to assist the underprivileged in acquiring technical education and training. “Besides, our grade school students, we will continue to provide support to students in practical training, mentorship and internship for women, girls and boys in the areas of vocational and technical education,” he explained. Mr. Locula stated that his organization is committed to the transformation of vulnerable and underprivileged youths, in order to enable them to contribute toward the peace and reconciliation processes of the country. He used the occasion to thank his many supporters including Vice President Jewel Howard-Taylor, Representative Edward Karfiah, Madam Leymah Gbowee and Ambassador Kimmie Weeks among others who are makingthe initiative a reality and asked others to contribute to the foundation’s work. Also speaking at the program were women, youth and traditional leaders who thanked Mr. Locula and other executive members for the establishment of the foundation and pledged their support to work along with them in advance the lives of various youths in the country. The Franklin Kpakolokoyah Alternative Initiative Education Empowermentlaunching program was attended by local leaders including clans and paramount chiefs as well as general town chiefs, women and youth leaders among others. Also in attendance were representatives of donor organizations that support the foundation, friends and students, some of whom hold scholarships from the foundation.